Beautiful engraved specimen certificate from the DoDah Worldwide, Inc dated in 2002. This historic document was printed by United States Bank Note Company and has an ornate border around it with a vignette of the company's logo. This item has the printed signatures of the Company's President and Secretary. 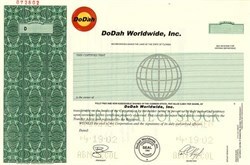 DoDah Worldwide, Inc. was a privately-held, Florida company that offered an Interactive Marketplace for businesses featuring streaming audio and/or video messages, without the need for viewer downloaded software or browser plug-ins. With DoDah's� proprietary Real-Time Advertising, businesses can enter and update their streaming messages at any time. Using patent-pending technology, DoDah� allows for successful, one-screen searches, even when words are misspelled. Air DoDah� is the exclusive portal for in-flight Internet access. DoDah� offers a high-impact, high-value advertising media for businesses and a high-impact digital media experience for viewers, on land and in the air.